Stephen Heppell and expert panelists recently spoke in Australia about physical spaces in The changing face of Education. Heppell, an international expert in the fields of learning, new media and technology, is known for his “eyes on the horizon, feet on the ground philosophy”. He has moved countless organizations into the digital age. One such project, Ingenium, created a learning space that adapted to the needs of different types of learners. Kinaesthetic learners who might not benefit from traditional classrooms, for example, had ample space that allowed movement. The panelists suggest that schools built in the industrial revolution are ill-equipped. Older spaces do not consider the entire spectrum of student success. In a digital age, our classrooms are falling short of preparing students for a global economy. The hope is that a new definition of student success might include a broader scope of learning. Heppell proposes that changes in physical space will foster real student engagement and encourage ingenuity. Physical spaces are central to creating a new paradigm for learning. What might these physical spaces include or what might they look like? Learning spaces should be comfortable. A new, yet simple, idea is that classrooms can be comfortable spaces where students feel at home. They might crawl up and read a book. Heppell proposes that we see few people reading in chairs outside of school, so it may be best to make cozy spaces in the classroom too. A changing space with mood lighting. Lights with different colors might, according to some research, create a fresh perspective. Just like in any environment, change allows for a mental break and lighting can do a great deal to alter a space depending on the activity. As an adaptation, I have seen some classroom teachers bring in lamps from home to create softer lighting during reading times. Allow different seating patterns and configurations. A variety of different furniture would allow students to work in different areas, depending on the project or time of day. Heppell’s daughter teaches at Stepping Stones, which adapts learning space for children with disabilities. Create Playful spaces. Bring the fun back into learning! Play helps teams work together effectively and creates meaningful learning engagement. Heppell mentions how Google gives employees space to be playful and play acts as a “powerful motivator” for learning. 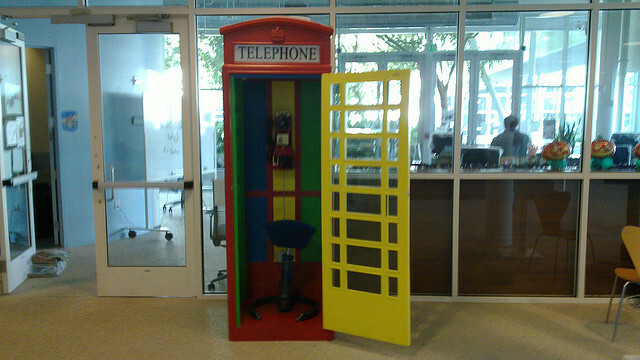 One of Google’s office features a colorful phone booth. Notions of Time – Different ways of structuring time might be beneficial, instead of traditional scenarios with rigid schedules. Teachers might look at immersion in one subject at a time. Time lost moving students around the school might be minimized by using technology. Encourage community involvement. Learning is a community effort. The philosophy that “it takes a village” to teach a child, resonates in that online communities can be used to support learning. Social media can be used to foster a sense of collaboration. The physical space of the school should also allow for other adults to participate in classrooms. Shoeless learning. Yes, shoeless learning spaces. According to Heppell, in Scandinavia and other countries children often learn with shoes off, perhaps because it reminds them of home and creates a relaxed learning environment. Bring the outdoors in. Some model classrooms have allowed an indoor/outdoor space that becomes an extension of classroom learning. Spaces might include a door that rolls back or time to learn outside. 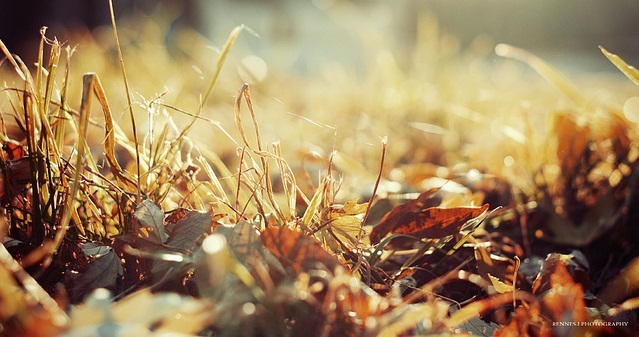 Some studies have even found that teaching outdoors might improve grades. Multipurpose spaces. Spaces that lend themselves to a variety of learning styles and activities are best. For instance, there might be an area for presentations, performances, or cooperative groups. Bright spaces with plenty of light and air. For Ingenium, students preferred spaces that were colorful and special vents controlled air flow. For instance, if it started to rain, ceiling vents would close automatically. Teachers might inexpensively replicate this by bringing in a fan or being aware of the temperature of the room. Technology accessibility. Classrooms that have a variety of media allow for different learning activities and might include a projector, a white board, digital cameras, laptops, satellite TV, video production, and even Ipad accessibility. Toilet accessibility. Believe it or not, according to Heppell some research suggests children try to avoid using the toilet during the school day. Having a bathroom attached to the classroom might be a way to increase concentration and help health as well. Designing for a space where students bring portable technology. Some experts argue that the PC will soon become obsolete to cell phones and laptops. In “Learning Environments of the Future”, Heppell parallels the example of calculators and ballpoint pens that were once banned in schools and are now encouraged as learning tools. Heppell believes that smartphones may the most powerful learning tool of all, as they allow for collaboration and are inexpensive. Spaces that foster creativity, rather than productivity. Traditional spaces designed in the industrial revolution were designed to maximize efficiency. For the 21st century, employers tend to look for teams that work organically in collaborative groups to solve problems. It would make sense to structure classrooms to reflect the needs of our global economy. Tiered seating areas. Tiered areas allow for groups to convene to discuss ideas and communicate procedures. These areas are especially helpful in classrooms that employ groups regularly. They allow for a space for group instruction or presentations. The speaker can maintain eye contact and a steady volume, rather than projecting their voice. Tiered seating creates an intimate, small group discussion format. Similarly, “cozy” carpet would work well for younger children. Storage areas such as cubbies and shelves. Organization is a key component of successful learning environments. A de-cluttered learning environment is free from distractions and allows the focus to be on learning. Students can move quickly through the space and easily access resources needed for various learning purposes. Design for different learning needs. Rather than rows of computers facing a wall, schools can use cheap piping to conceal wires and face computers in different configurations. Layouts should adapt to the learning, rather than limiting the learner. Classrooms should be designed to allow accommodation for varied learning styles and learning disabilities. I remember taking a student with Autism to recess and being afraid of him hurting himself outside. Special foam recess areas using recycled tires, for example, might allow his time outside to be free while adapting to his safety needs. Signage and displays. Small details, such as wall displays are important. For example, signage in the classroom should try to stay away from the negative. Lists of rules with DO NOT drink, eat or talk, can send a bad message. Instead, signs might include positive reinforcement. In addition, student displays can include a description of the thought process behind the work. Virtual spaces. Online mediums such as skype and virtual portfolios, can be included as part of learing. 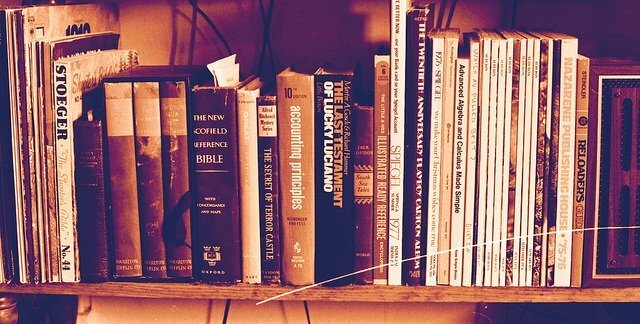 Heppell argues that the future of education will turn to virtual formats. Cloud Technologies. A recent article in Business Today discusses that LG has partnered with Microsoft & KIE (Kenya Institute of Education) to launch a model classroom that incorporates new cloud technology. The aim is to lower the cost of IT in schools. Cloud allows multiple users to share one main computer using Windows MultiPoint Server 2011. Generation Y wants their learning to be playful and exciting. Classrooms should be spaces that students don’t want to leave. Some communities are still hesitant about these futuristic looking learning spaces and have resorted to older, traditional physical spaces. Hopefully, they will begin to embrace changes to better prepare students and move them in the 21st century global economy. Except that, when I sit in an easy chair & read, that’s entertainment. At a desk, w/ a real chair, I can spread out my books, papers, notes, computer, phone, etc. Today’s students are too “coddled, and into games”. Real life is work! If education is too much like leisure, many won’t learn. Oh, some will. It’s the same as the desk system: Some learn that way, some don’t. You’re not improving things, you’re merely re-shuffling them. Learners that once learned, now don’t, learners that once didn’t learn, now do. You’ve made no net gains. The problem with all these “cool” ideas (And some are interesting! ), is COST. Taxpayers are already overloaded. Teachers are headed for a rude awakening, and a nasty revolt. I look at my tax bills. Roads, sewers etc, stay pretty much the same. But City Hall salaries & the education component skyrocket. We simply can’t take it any more. You know, if teachers do not like their jobs, perhaps, they should quit…. Moving kids around gives ’em a break between subjects. It allows the mind to “reset”. And studying 1 subject all the time? Idiocy. Can you imagine “math for 7 hours”? Or worse, a boring topic like… history? Well, the math buff will like math 7 hrs. The history buff will be in tears. But the math buff, will snore in 7 hrs of history class. The history buff? Even he’ll get bored. Get my point? Now consider physics, biology, accounting, economics, chemistry, PE, civics, or other topics for 7 hrs! OW! Yes, SOME kids will learn better. Most, won’t. The Chem kids will love chemistry for 7 hrs, and learn lots. The others will either be in tears, or blow up the lab. The mind needs to change gears once in a while. Google: “Diminishing Returns to Scale”. I am sorry, there is some small value, in certain places, at certain times to all these ideas. But from a cost-benefit viewpoint, there is no profit in the deal. We might break even. We might lose a lot. Business votes “no”. If teachers really want this stuff, let them make a major investment! I bet they will not. Bringing in a lamp, is not tearing down & rebuilding a school. Only for teaching and sports, does the taxpayer foot the bill for the workplace. And we get too little benefit out of it. Hey Pete, thanks for your comment. You’ve raised some very good points. These issues are far from resolved, and some debate their value. Obviously this article isn’t meant to be an exhaustive resource for the subject – that will take a book to accomplish, maybe multiple books. But I think dismissing ideas due to its cost is a surefire way to stagnate. If research shows a hint of their effectiveness (and many do), the question should be, how the education system can afford it. The key, I think, is to keep an open mind – InformED is a blog that features conversations, not dogma. I agree all ideas aren’t possible to implement in every situation or for every learner. I think the idea is more to push the envelope of what constitutes learning models. My purpose was to have us reconsider the structure itself of learning environments to see how they influence teaching and learning. I agree that with cost restrictions can be limiting. Having worked as a public school teacher I can totally relate to how you feel about that, but some changes are more a matter of changing minds and perspectives before investing money. With the immersion model, I was referring more to combining two or three subject areas together in a project or using it for a short period of time. I should have been more specific on that one. I sincerely appreciate your feedback and hope to open a dialogue about the future of education. Thanks for your comments. Once again a great read, thank you. in every situation the best way out is get the learner to love to learning which in any case every child right from birth love to do – to find answers to this strange place called earth with creatures who are behaving wired… every child is eager to discover, but the problem is how we order the path to find the answers…. the way forward is to inspire learners to love to seek knowledge with or without guidance… this is basic instinct..